I was rereading some works of Guénon and there were several reverences to this book that I did not have. I could quickly get a cheap copy of it, so this is a title to add to my Guénon library. Most other books are published by Sophia Perennis, but this time I got a Quinta Essentia book. As the cover of this version suggests, there is quite some ‘Chinese information’ in this book. The symbol is called Wang and the three horizontal lines Guénon connects to heaven, man and earth, the vertical line connects the three. Hence: a triad. There are many more references to (ancient) Chinese philosophy in this book. Of course there are even more references to other traditions. Guénon went out for all different kinds of triads, such as the alchemical sulphur, mercury and salt; the Christian spiritus, anima, corpus and of course the Hindu Triratna. The most interesting part is the beginning. Guénon finds it odd that all trinities are so easily compared, while they are not. He makes a difference between trinities in which the two emanate from the one, like in T’ai Chi -> T’ien and Ti; and trinities in which two bring forth a third, father, mother -> son. Then -of course- there are less clear trinities, such as Father, Son, Holy Ghost. But there are also ‘ternaries’ in the book, heaven and earth, solve and coagula, etc. and representations of them such as Yin and Yang, the double spiral and more. 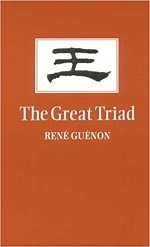 Indeed, The Great Triad is another of Guénon’s books about symbolism, a type that I enjoy a lot. Of course you will also run into his Traditionalist ideas with -for example- a chapter about “Distortions on modern philosophy”.